Karen Tingley, Co-PI from the Wildlife Conservation Society, also served as the Building Strong Community Networks (BSCN) Project Director. BSCN was a two-year action research project, funded by the Institute of Museum and Library Services and The Rockefeller Foundation, which focused on identifying and creatively responding to Brooklyn’s community needs through the collaborative efforts of six Heart of Brooklyn cultural institutions, including the Brooklyn Botanic Garden, the Brooklyn Children’s Museum, the Brooklyn Museum, the Brooklyn Public Library, Prospect Park, and the Prospect Park Zoo. The project resulted in a number of successful community initiatives, as well as a free online workbook. 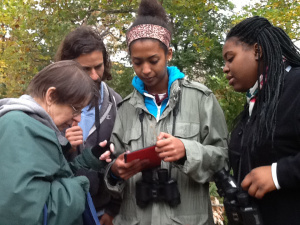 The “Project True” partnership between the Wildlife Conservation Society and Fordham University provided 25 New York City high school students with ten-week-long research internships to study either arthropod or bird diversity in an urban environment. The students produced a blog and also shared their research projects among themselves, with their school principals, family members, and others. Visit the BSCN website to learn more about the project.